The latest news from LSI is shown below. Click on a news item title or "Read More" link to read the entire news release. Pro Mach announced today it has acquired Greydon, Inc., a leading manufacturer of inline printing and coding solutions for flexible packaging. The addition of Greydon expands Pro Mach’s extensive labeling and coding product offering and complements existing capabilities in flexible packaging. ID Technology is featuring a high speed wrap labeling system with TTO printer and vision inspection system from LSI, their Labeling System and Integration arm, at Pack Expo International; booth N-5406. Labeling Systems will be showing a new addition to their line of labeling equipment – the new Series 25 Label Printer Applicator – at Pack Expo Las Vegas, Booth C-2514. Labeling Systems is introducing at Pack Expo the new Series 22, a two color print and apply labeler. The system includes two print engines, one with a black ribbon and the second with a red ribbon. Labeling Systems will be demonstrating a broad range of the latest pressure sensitive labeling technology at Pack Expo International, October 28-31, in Chicago’s McCormick Place. While the Model 1400 is suitable for most corner wrap applications, the system can also be designed to fulfill e-pedigree or track-and-trace initiatives for the pharmaceutical industry. 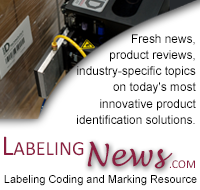 Labeling Systems (LSI) offers the Model 1500 Wrap System with a Three Point Wrap Station. The three point wrap station is ideal for applying long, narrow labels, or in applications that require orientation of the product to a certain physical feature, such as a seam or container handle. Starting with a base price at just $6,825, LSI offers a cost effective solution for print and apply labeling solutions. The Labeling Systems Model e300 is a full featured label applicator with variable speed stepper motor that achieves speeds up to 1,000" of label web per minute. The LSI Model 1360 Loose Loop Print & Apply labeler is designed to apply thermal transfer, direct thermal or pre-printed labels at rates up to 120 products per minute. If you are looking for the perfect labeling heads for your labeling needs, contact LSI and ask about the Series 30, Series 40, and e300.